Scoop! Thanks to The Teaching Trio for this reflective linky! I love insects. They are fascinating to littles, but sometimes FOSS doesn't have enough..."STUFF". So, I started making a new pack for them and it is going over big! Our painted lady caterpillars are now chrysalis...so next week we get to learn about butterflies! Our school garden is ready for planting...and this year with my 5th graders we are learning about Victory Gardens. I have been fortunate enough to have my father in laws WWII artifacts. Now that I teach science and not social studies...I don't get to use them, but I figured out a way to teach social studies in science! This week, is scholarship night for my senior. Wish her luck! She is working hard to earn money for college through being a CNA this summer...she is certified...YES! But, scholarship money always helps! Oh, it's totally crunch time! I'd love to take a day for myself, but there's just so much to do! Good luck getting it all organized. It sure is crunch time! I have 36 school days left. I can't believe it. One minute I'm thrilled and the next I'm freaked out! Callie sounds like a dedicated, hardworking young woman. Hope all goes well on Scholarship Night. Your Victory Garden unit sounds amazing. I wish I could pop over to Wisconsin to observe! Definitely crunch time! 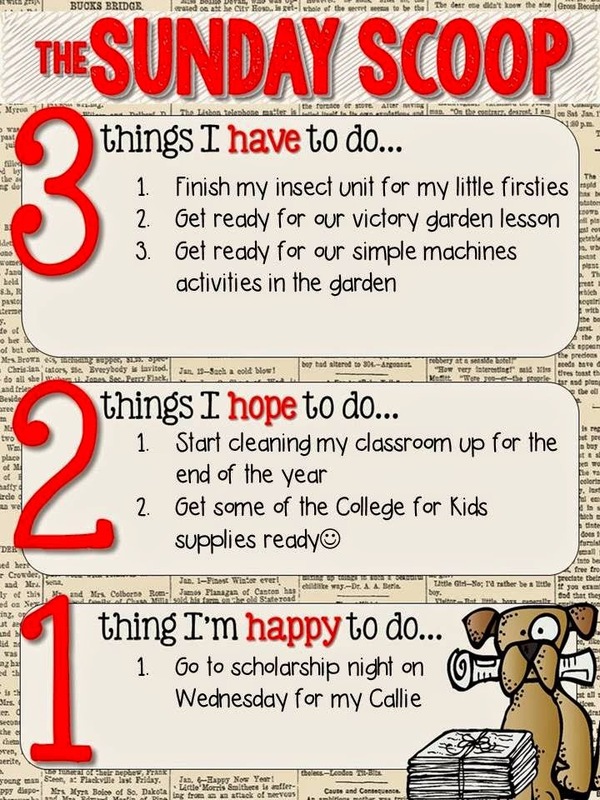 I feel like every day is just packed full of things to do! At least we can all look forward to summer break!